This new collection describes the struggle for law and order from the earliest days of Arizona settlement until 1912. The Gunfight at the O.K. Corral and Pleasant Valley War, the largest range war in American history, are two major gunfights in the state’s history. 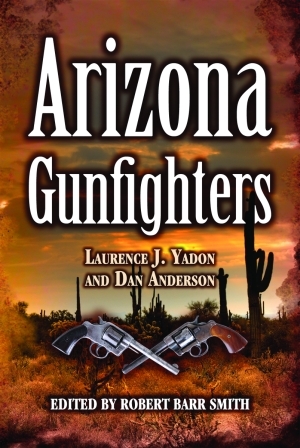 In a mélange of stories from popular history authors Laurence J. Yadon and Dan Anderson, this work not only describes what happened in the Old West days of Arizona, but why it happened. Just before the years of statehood were the days of train, stage, and bank robberies. Cattle rustling and conflicts between cow men and sheep men all sparked flames of vengeance that would later explode into torrents of violence. The characters involved include the Christians, “a remarkably unsuccessful gang of outlaws”; the Earps; the Tewksburys; Doc Holliday; Curly Bill; and virtually all of the most prominent Arizona outlaws of the era. Citing newspapers, letters, and diaries, the authors distinguish fact from fiction, proving again that the real stories of the American West in general, and Arizona in particular, are usually more interesting than the legends. Laurence J. Yadon is an attorney, mediator, and arbitrator. He gives presentations on various legal subjects and crime history. Members of Yadon’s family participated in some of the most violent wartime incidents in Missouri. They also were related by marriage to the Youngers of the James-Younger gang and their first cousins the Daltons. Dan Anderson is a former newspaper journalist and photographer for Pryor, Oklahoma’s, Daily Times. He reported on crime, cops, and court cases. Anderson has been honored with awards from both the Oklahoma Press Association and Associated Press Oklahoma for his writing and photography. Anderson and Yadon are also the authors of 100 Oklahoma Outlaws, Gangsters, and Lawmen: 1839-1939; 200 Texas Outlaws and Lawmen: 1835-1935; and Ten Deadly Texans.